This is pretty awesome. 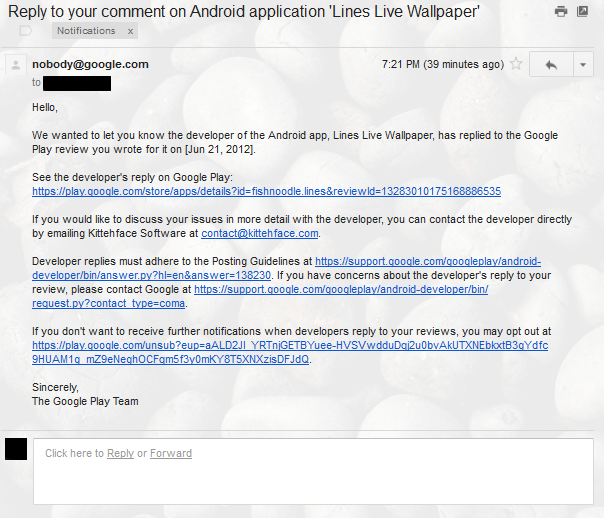 At long last you can now reply to comments on the Google Play listings! This doesn't sound like much, but it's not uncommon to see people mention bugs or other issues in the comments, without actually sending you an e-mail. This makes it effectively impossible to follow up, ask questions, inform them their issues is fixed, etc. Especially if it's a recently posted product, this is kind of nerve wracking. No more! If you log into your Play Publisher account, and head to the comments section on a product listing, you now see a "reply" prompt that does exactly what it says. The reply is displayed on the listing inside Play, and in addition the user receives a notice that a reply has been posted. We just tested this, and the user does indeed receive an e-mail. 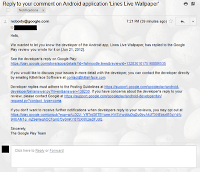 The text of the reply isn't contained, rather they receive an e-mail from "nobody" (oddly enough) notifying them that one of their comments was replied to by the developer. A link is provided underneath that. Clicking the link takes them to their comment and its reply (which worked). I'm happy to see the message also encourages them to use e-mail for reporting further problems.